Usually, girls are much pickier than boys. They pay attention to not only experience, but also appearance. Private car may be is a good idea, but it is often stuck in traffic jam and also difficult to find a parking lot. However, it is so not gentlewomanly for them to ride ordinary bicycle or electric vehicle on road. Now, there is a travel transport that can avoid traffic jam and also make girls elegant riders, whose name is Fosjoas K3 sitting-posture self-balancing two wheel electric scooter. Let’s see the novel and fashionable appearance of Fosjoas K3. It is made up of two big tyres, a leather saddle, a delicate LED panel and a kickstand. More importantly, these parts are made from high-quality materials. Based on ingenious design idea of world-class designer, Fosjoas K3 two-wheeled electric scooter owns an exquisite and high-end appearance, which caters for the taste of every girl. The performance of Fosjoas K3 two-wheeled electric scooter is absolutely perfect. It keeps itself balanced on the basis of aerospace attitude control theory, fuzzy software algorithm and gyroscope system. It means that girls sit on the seat and gently lean forward or backward. Then, Fosjoas K3 two-wheeled electric scooter will move forward or slow down. 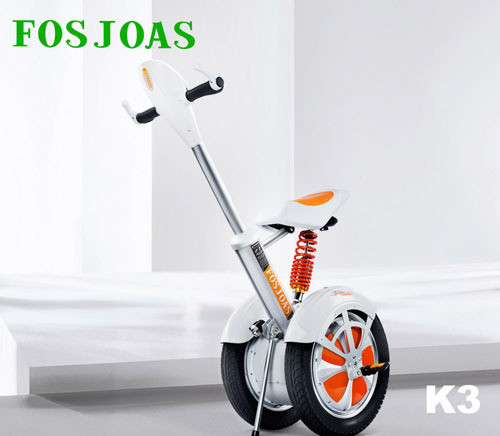 In order to make sure high safety and comfortable riding feel, Fosjoas K3 self-balancing electric scooter is protected by three systems, which electronic brake system, automatic steering-sensor system and original hydraulic suspension system. The first one fully assures girls’ safety during emergency braking and the second one ensures safe night riding. The last one is used to absorb the bumps on road so as to smoothen the riding. Now, it remains the last question: what can it do for girls? Briefly speaking, it can cover all of travels in girls’ life. For example, it is a fantastic commute transport to go work or school.